We’re all on the road to enlightenment, each walking at our own pace and in our own time. If we’ve been on the path for some time, we can feel discouraged when, despite our best efforts, we spiral down and experience dark thoughts and emotions. This may happen due to an unforeseen loss, heartbreak, things not going according to plan or the darker times on the seasonal wheel. It’s inevitable we’ll all spiral down to the depths of our psyche more than once, so here’s my user guide for finding your way back to the light. Everything in life is cyclic – DNA, the seasons, the planets – and so are we! In the ancient world, people sought feminine wisdom to navigate life’s downward spirals so they could embrace times of chaos and confusion as an opportunity to mature and grow their wisdom. Without access to these wisdom teachings we can interpret times of chaos as some kind of personal failure, rather than see them as initiations to deepen our personal understanding. So let’s take a look at what can trigger us into a downward spiral. Are You Afraid of the Dark, Change or the Unknown? The dark, times of change and the unknown are all initiations into the feminine side of our psyche. After 5,000 years of feminine wisdom being suppressed, understandably many people are afraid of the dark.... This doesn’t just mean being outside with no flashlight but experiencing our darker thoughts and emotions. Why? We’ve been conditioned to associate darkness with fear, so we resist going within to explore our dark inner states. In the Goddess tradition, ‘going within’ was celebrated, with festivals at the start of Autumn (Fall) to commemorate the heroes and heroines who took up a quest to explore their wounded inner self during the darker months. The rise of the Roman Empire outlawed this tradition so, instead of the Underworld being perceived as the ‘Cosmic Womb’ to which we return cyclically to rebirth ourselves, we were conditioned to fear the darkness as Hell, a place of eternal suffering. The word, ‘Hell’ was taken from the Norse Goddess, Hel who originally presided as a midwife to help souls navigate their own inner darkness in the Underworld. If we focus on the outer world during transition times of intense change, it’s easy to feel overwhelmed. Our challenge is to stay centered and observe the thoughts and feelings surfacing within us. This helps us be in the void – the place of uncertainty. When we’re centered, it’s easier to attune to the deep knowing within us – our intuitive guidance that can direct us like a miner’s light in a cave. Below is a map of the terrain to navigate your way out of the Underworld the next time you find yourself sitting at the bottom of the well, followed by some practical processes to help you stay centered and access your soul wisdom. Surrender. Allow everything to unravel as you’ll wear yourself out trying to keep everything together if it’s highest will for your life to fall apart. This initial stage can make us feel crazy with frustration when it seems that nothing is going according to plan, so we may be tempted to throw a cosmic tantrum at what we feel is divine injustice. Like the saying, ‘you have to lose yourself to find yourself’... we often have to lose our minds in order to hear our soul. The feminine initiates us into humility through chaos. We have to surrender to destruction and loss for creation and rebirth to occur. The Celts believed whatever was surrendered to Ceridwen, the Goddess of Death and Rebirth, would always be replaced by a gift of equal value and the bigger the loss, the bigger the rebirth. Ultimately, a new perspective and structure can only emerge if we release the old. Trust the Process. If we fight the process, we prolong our suffering. Seek to become like the feminine element of water and let go of attachments and expectations while affirming, ‘this too shall pass’. If we resist what is happening, we become rigid, brittle and break whereas if we relax, we’ll do less damage. Cast the Burden. Like the adage, ‘ask and it is given’ be sure to invoke divine assistance when you feel lost. Why? One of the Universal Laws that govern us all is the Law of Free Will. Our spirit guides and ancestors can’t help us unless they’re invited to do so. Call upon whichever ascended master, archangel or Goddess you prefer to assist you in your hour of need and visualize handing over your burdens, worries and fears. You can then stop fixating on them and mentally going round in circles. This simple sacred act of intent helps us become receptive to insights that can pierce the darkness of our mind. Incubate. When we have a lot going on internally, we can feel like we don’t have the energy for the outside world. Allow yourself retreat time to rest and reflect on your past hurts and experiences. Gestation is necessary if we are to birth a new perspective. Do not feel ashamed if you want to stay in bed and cocoon as this is what is necessary to facilitate your inner transformation. The more we accept that it is perfectly natural to undergo this chrysalis time, the easier it will be. Allow Yourself to Feel. In the act of birth, every unexpressed emotion finds the nearest exit. So too, when we’re birthing a new life chapter, identity or perspective, we can feel extra tender and emotional. Just as the most growth occurs in Spring, when we have the highest rainfall, our tears allow us to soften and become fertile for inner growth. So aim to become Zen about your feelings and allow them to surface and be expressed freely and without judgment. This ensures we don’t stay stuck in one suppressed emotional state, which results in depression – feeling grey – although it does mean risking feeling black in order to again feel the other colors on the spectrum. Face Your Shadow. Our shadow is comprised of our deepest, darkest fears about ourselves. Just as a thriller film is made more terrifying by the suspense of the worst moment, our anticipation of confronting our greatest fear is often worse than the moment we acknowledge we possess the traits we have most vehemently denied and judged in others. Acceptance. This is the turning point, when we accept and integrate what we had once rejected in ourselves. Self-acceptance shifts us out of the critical mind and back into our hearts, the place of our soul essence. Taking responsibility for our dark side activates our inner parent, the one who embraces our wounded inner child and will love us unconditionally, making us feel more whole and healed. When next you find yourself feeling dark or experiencing change, loss or confusion, try one or more of the following practices to help reconnect you with your soul wisdom. Creative self-expression, such as poetry, painting, and composing music, helps us transmute negative experiences into works of beauty and wisdom through accessing the language of our soul. Art helps us heal and integrate trauma by recording our inner landscape; this helps us make sense of the dark and return to the light. Parables and myths help us identify our archetypal lessons and provide a map to integrate disassociated aspects of our psyche. Simple self-created rituals help us to set clear intent, anchor changes, and surrender to a higher power by invoking insight and guidance. Dream analysis and oracles help us consciously understand messages from our subconscious, and they act as keys to new ways of seeing. Bathing and guided meditations help us enter the stillness, so we’re receptive to intuitive insights. 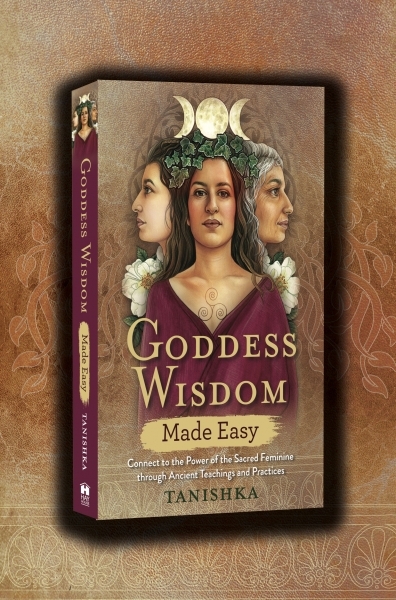 Delve deeper into this topic: get your copy of Goddess Wisdom Made Easy by Tanishka today.